A career in real estate offers flexible hours and unique perks, but before all of that, you'll need to understand the process of becoming an agent. The reasons someone might be interested in how to become a real estate agent are plentiful. The potential of a hefty payday combined with a flexible schedule is certainly enticing -- and if you're a people person, you'll never feel more at home. But don't be fooled by glitzy reality shows about Realtors selling giant houses and making easy millions. Real estate agents are essentially self-employed, and often put in a ton of work and training (not to mention their own money) to succeed. Combine the cost of classes, exams, business cards and advertising and new agents can easily spend up to $2,000 in just their first year. Still, in an industry teeming with potential, those who enter it are excited to learn the tricks of the trade. Kathryn Lionetti, a 23year-old recent addition to Weichert Realtors in New Jersey, compares being a new agent "to a freshman orientation, where training is supposed to be packed with information provided by the real estate company you chose." The general path to becoming a full-fledged real estate agent usually involves taking classes, passing a state exam and finding a place to work. Yet when you look closer, each aspiring agent's path is different -- not just because of people's personal paths, but because of where they chose to become an agent. 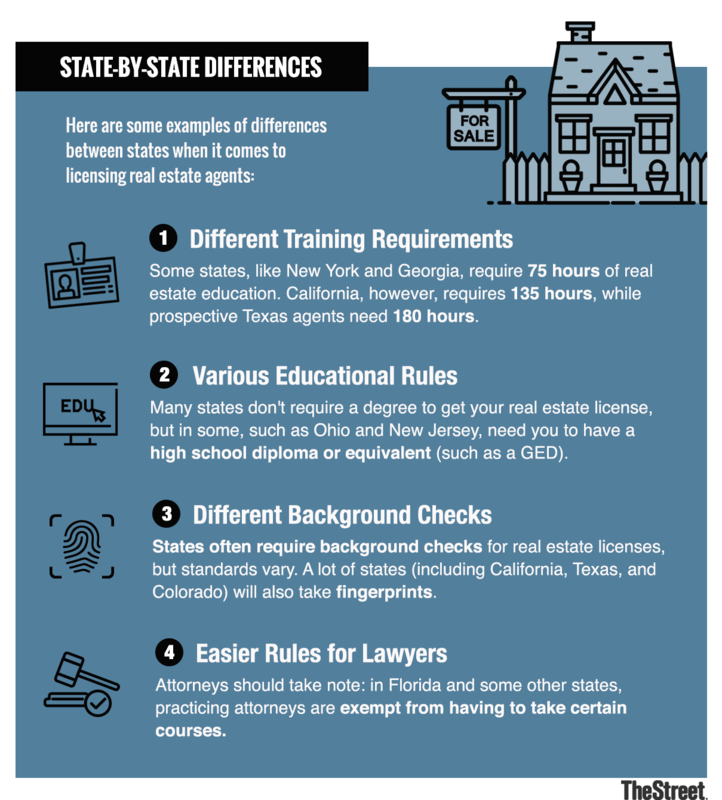 After all, the specific details within the requirements for getting into real estate vary from state to state. A real estate agent from New York can talk all about how they got to where they are, but an agent from Nebraska took a different path. You'll often need to take several different courses before taking your licensing exam. You'll almost certainly be paying at least $200 or more for these classes regardless of your location, and that's on the low end. For example, Brightwood College offers classes in Georgia starting at $299, while the New York Real Estate Institute (NYREI) offers salesperson-licensing courses for $395. You can take your classes at real estate institutes or certain colleges, and there are also plenty of online options that can fit into a busy schedule. Just remember to get your transcripts and a certificate that confirms completion of the courses after you're done. You'll need these for your license application. In addition to your required coursework, many institutions also offer exam-prep courses. They're not mandatory, but many applicants enroll in one or more to feel comfortable when taking the licensing exam. Once you've completed coursework, you're ready to apply for your real estate license and take the required test. Expect to pay more than $300 for your license application, exam, background checks and the license itself (assuming that you pass the test). How likely is it that you'll pass on the first try? According to the Texas Real Estate Commission's information on Provider Exam Passage Rates, 57.4% of applicants who took the Texas test between February 2016 and February 2018 passed. So, those who diligently do coursework and preparation have a good chance of passing on the first try. Many people use "Realtor" and "real estate agent" interchangeably, but there's actually a world of difference between the two. A "Realtor" is a member of the National Association of Realtors, or NAR. Realtors pay membership dues ($120 as of 2018) and are expected to follow a strict code of ethics. In exchange, they receive a number of benefits, including access to exclusive marketing resources and discounted continuing education. So, while not required, becoming a Realtor is worth looking into. Once you've passed the exam and have your real estate license, that's not all that's needed to practice real estate (at least initially). In most states, new agents must work with a broker that chooses to sponsor or manage them, at least for the first two years. Some states even require aspiring agents to have a sponsoring brokerage before taking the exam, so it's wise to start looking as early as possible. Real estate agents don't generally receive a salary from their brokerage, but instead make commissions on sales and listings. Typically, commissions are paid out to four parties: the listing agent, the buyer's agent and their respective brokers. Many brokers split commissions with their agents at agreed-upon percentages, often 50/50. Other brokers let agents keep as much as 100% of commissions, but those agents typically pay a "desk fee," a monthly fee just to have a desk and resources at the brokerage's office. It's important for new agents to start connecting with industry veterans. Make friends in the field, and find a mentor at the brokerage who can offer real estate insider tips and wants to help you succeed. Kathryn Lionetti, the 23-year-old who's just entering the field, says it's important to develop a reputation as someone who will learn quickly and use that information well. "When interviewing they have to see you as valuable. They're sharing with you their resources because they see your potential." It's a lot of work to get to that point, and more work after that to succeed at it. But for those who love doing it and truly want to thrive in real estate, it's worth it. All costs and specifics are as of March 2018.